Two hundred and forty years after the last Pueblo people had left Colorado, Hernán Cortés de Monroy y Pizarro-or maybe it was Quetzalcoatl-stepped onto the shores of Veracruz. Arriving at the Aztec capital of Tenochtitlan less than seven months later, the Spanish had no trouble recognizing kings and slaves, temples and markets, gods and warriors, and all manners of artifacts and other institutions, none of which existed when the ancestors of these two societies last lived together in Eurasia. What accounts for the surprising mutual intelligibility of social forms between two societies who shared their last common biological and cultural ancestors tens of thousands of years ago? Undoubtedly the shared biology (proximate by the standards of biological evolution) and perhaps the shared culture (which however was very distant, by that more rapidly changing standard) had some effect in channeling development in certain directions rather than others. But another possibility that needs to be considered is that winnowing of less-efficient forms by selection through competition among groups may have shaped these otherwise independent historical trajectories. Some solutions to the puzzle of how to induce people to cooperate with large numbers of other unrelated people probably work better than others, and if invented independently, might be maintained. This logic helps us understand, for example, why markets appeared alongside older reciprocal exchange systems as Pueblo peoples began to concentrate in the northern Rio Grande region of New Mexico in the A.D. 1300s (Kohler, Van Pelt, and Yap 2000). Markedly less-workable solutions tend to be supplanted, whether through lethal intergroup competition, non-lethal cultural group selection, selective migration, or related processes (see review in Salomonsson 2010). But such arguments are only plausible if we can show that adaptation, a concept we are borrowing from biology, has some relevance for understanding cultural behavior. This might seem a modest claim-we are not for example proposing that natural selection is a "universal acid" explaining all aspects of culture and its contents, as Dennett (1995) sometimes seems to do. But as we shall see, even this modest claim would be dismissed by some. Societies are likewise in constant interaction with the environments they inhabit. They modify those environments by accident and on purpose, affecting their short- and long-term productivity. How could it not be the case that this also affects the success of the societies? One common characteristic of Neolithic societies is the rapid population growth they experience. If per capita use of resources remains constant as population grows, resources that regenerate slowly will be drawn down. This may soon require societies to move to previously uninhabited areas if they are available-but eventually, this option will be impossible and new patterns of resource usage must be developed. Societies unable to innovate these patterns will be displaced by those which could. The general growth of Neolithic populations also favors those groups who can effectively coordinate the largest numbers of people, since large cohesive groups can displace smaller or less cohesive groups, or resist displacement by others. These two pressures-building larger sedentary groups without depleting the environment-are at odds with each other. This contributes to the dynamic character of the Neolithic record in most areas; in finding an effective compromise between these two opposing forces societies are driven to a position on a metaphorical fitness landscape where they become extremely vulnerable to external perturbations such as climate change. Eventually we would like to examine how these processes play out in Neolithic societies all over the world. (We suspect that they are completely general!) Unfortunately, there are few places where the Neolithic sequences are well-enough known to make this possible in any convincing detail. In this volume we analyze these social and "socionatural" processes through an extended case study set in southwestern Colorado between A.D. 600 and 1300. This is a fascinating 700 years that takes us, in the first 200 years, from the arrival of small groups of maize farmers into an almost uninhabited mesa and canyon country, to the emergence of some of the Southwest's earliest and largest villages. But around a hundred years later, by A.D. 900, most of the villages in our study area disband and their inhabitants depart for the south or west. The remaining households once again lived mostly in small hamlets until about A.D. 1080 when a new wave of colonists arrived from the south bringing a differently organized village lifeway backed by a novel, powerful political and religious system that united most of the eastern Southwest. Within 200 years this wave, too, receded, again to the south, leaving behind the famous ruins of Mesa Verde National Park and the less-well-known, but more populous district that includes Canyons of the Ancients National Monument, where our work centers (Plate 1.1). Even before the project we report here began in 2001, archaeologists knew more about the development of societies in this area than we did for almost any other comparable Neolithic society anywhere in the world. For that we thank generations of researchers, recently including Hayes (1964), Kane (1986), Lipe et al. (1999), Rohn (1977), Varien (1999a), and Varien and Wilshusen (2002), among many others. Why, then, another volume? The answer lies in an exciting opportunity that the National Science Foundation (NSF) presented in 2001 for a "Biocomplexity in the Environment Special Competition" in "coupled natural and human systems." NSF recognized that understanding how humans interacted with ecosystems over long periods of time required both deep interdisciplinary collaboration and modeling. They also saw that such research was not being generated by their existing programs. When the authors of this chapter saw this call for proposals, we recognized it as providing precisely the sort of research program we had been trying to put together. We also saw that we needed help to carry out the kind and scope of research that NSF was requesting, and we assembled a team to create a research proposal that came to be known as the "Village Ecodynamics Project" or VEP. Fortunately we weren't starting from a blank slate. Kohler, an external professor at the Santa Fe Institute, had recently hosted a conference there on agent-based modeling (Kohler and Gumerman, editors, 2000) where Bob Reynolds presented a paper on his research with Joyce Marcus and Kent Flannery on the role of conflict in the prehispanic emergence of chiefdoms and states in the Valley of Oaxaca (Reynolds 2000). Bob is nearly unique among computer scientists in having a long history of collaboration with archaeologists-complexity pioneer John Holland and archaeologist Flannery had co-chaired Bob's dissertation committee at the University of Michigan. By then a computer scientist at Wayne State University, Bob agreed to join our team as a principal investigator on the proposal, and among the many assets he brought to the collaboration was Ziad Kobti, then Bob's Ph.D. student. Ziad reports on VEP efforts to model local exchange among households in our simulations in chapter 13. Given NSF's charge to understand how societies were shaped by their changing environments, and how those societies in turned altered their environments, we also needed a partner who could bring a broad understanding of humans in their landscapes. A second acquaintance from an SFI workshop, hydrologist Ken Kolm, agreed to take a leading role in this research to help us understand the interactions through time between people and water, which we thought would be especially important to model on this semi-arid landscape. Ken, then of the Colorado School of Mines, brought along his Ph.D. student, Schaun Smith. In late 2001 this team drafted a successful proposal to fund what we came to call the "VEP I" (NSF BCS-0119981). 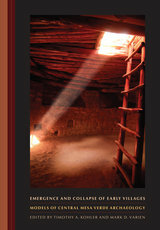 Kohler also brought a group of graduate students at Washington State University (WSU) to the team, and Varien involved the staff at the Crow Canyon Archaeological Center, especially Scott Ortman, who assembled the database of archaeological sites discussed in chapters 2 and 14. We have been at it ever since! As we write this in 2011, our research is now supported by a grant program at NSF called "Dynamics of Coupled Natural and Human Systems" that grew out of the special competition that funded the first phase of the VEP. VEP II is organically connected to the project reported in this volume by continuity of many personnel and most research interests to our work during the initial phase of the VEP reported in this volume. Many students from the first team however now work for a living: Fumi Arakawa is embarking on an assistant professorship at New Mexico State University; Sarah Cole is President of Red River Archaeology in Dallas; Jason Cowan works as an archaeologist for CRC in Washington state; Donna Glowacki is an assistant professor of anthropology at the University of Notre Dame; Dave Johnson is now an archaeologist and tribal liaison for the Bureau of Land Management in Arcata, California; Scott Ortman holds a dual position as the Lightfoot Fellow at Crow Canyon and the Omidyar Fellow at the Santa Fe Institute; Schaun Smith is now a staff scientist in the Environmental Unit of Chevron Energy Technology Company in Houston; and Ziad Kobti is an associate professor of computer science at the University of Windsor. Over the years we have seen the stream of research undertaken in 2001 lead to some fundamentally new ways of thinking about and seeing the past. Part of this is due to the interdisciplinary nature of our research, part is due to modeling the past using computer simulation, and part is due to amassing synthetic databases on all known archaeological sites in our study area. Together these allow us to develop "model-based approaches" (Kohler and van der Leeuw 2007) to generate and test expectations about what the past might have looked like if certain processes were dominant. For the VEP, it was a case of being in the right place at the right time. There are few areas in the world where the past environment can be reconstructed in such detail and linked so precisely to ancient subsistence practices; this reconstruction of ancient environments and subsistence practices was a fundamental aspect of the computer simulation. Further, there are few places where we could assemble so much previous archaeological research and analyze it in productive ways, though we had to develop new approaches to make that possible (Ortman et al. 2007). As a result, the VEP can use the computer simulation to generate models and evaluate them through quantitative comparisons to the archaeological data. The VEP conducts socionatural research (van der Leeuw and Redman 2002); we examine the long-term interactions between humans and their environments. The network of scientists making this possible includes archaeologists, computer scientists, ecologists, an economist, geologists, and hydrologists, among others. We focused this research on an 1817 km sq2 study area in southwestern Colorado, in the heart of the central Mesa Verde region, one of the most densely occupied portions of the prehispanic Pueblo world. For analytical purposes we divided this area into 45,400 cells that are 200 m on a side, or 4 ha, and selected the period between A.D. 600 and 1300 as the time frame for our research. An important goal of the VEP is historical research that seeks to explain the development of Pueblo Indian society in this area during these seven centuries. Equally important, the VEP seeks to use what we learn about these societies to better understand the general processes that underlie human social evolution, especially during the Neolithic, that pivotal epoch when humans first adopted domesticated food production. Two major efforts define the VEP research. The first is an agent-based computer simulation that reconstructs past climate and environment, models how annual variation in precipitation and temperature affected productive resources, and examines how humans use these domesticated and wild resources. The agents in this computer simulation are households, although the simulation tracks the fortunes of each individual in these households as well. These virtual households are let loose on our reconstruction of the prehispanic landscape of southwestern Colorado in A.D. 600. For the next 700 years, the households farm maize, obtain drinking water, collect wood for fuel, hunt mule deer, jackrabbits, and cottontails, and-in some versions of the simulation-exchange maize and meat with each other. The second major VEP effort has been archaeological research to summarize the ancestral Pueblo occupation of the study area. This was accomplished by constructing and analyzing a database of all known archaeological sites in our study area-about 9,000 in all-supplemented by a database of all tree-ring dates from the region. VEP archaeological research focused on the 3,176 sites determined to be habitations, including 92 sites we termed "community centers" based on their larger size, longer occupations, and distinctive architecture that included public or civic structures. Additional research was conducted at community centers, including some new fieldwork. The broad questions about coupled natural and human systems emphasized by the VEP led us to focus on three aspects of the ancestral Pueblo occupation of the study area. First, we sought to understand how farmers located themselves and used resources on this landscape. Second, we wanted to examine the exchange of subsistence goods among households and whether this exchange caused households to aggregate into villages in certain times and places, and disperse into smaller settlements during other times. Finally, we wanted to determine why our study area and the surrounding Mesa Verde region was depopulated in the late A.D. 1200s.These general questions required us to answer other more specific questions. What were the population dynamics during the 700 years when the study area was occupied? Could farmers continue to grow maize in sufficient quantities during the driest and coldest years? Did domestic water supplies disappear during prolonged drought? Was the landscape depleted of wood resources during the long-term occupation of study area? Could people sustainably meet their needs for protein by hunting deer, jackrabbits, and cottontails or would they tend to seriously depress these animals over time? How was exchange affected by the distribution of resources? What was the history of conflict in the region?These and other questions have shaped the VEP research program, and we determined that they could only be answered by integrating computer simulation and archaeological analyses. Some problems were more directly addressed through simulation, others through archaeological studies. Ultimately, the strength of the VEP was our ability to play the simulation and the archaeological analyses off of each other. The organization of this volume reflects this integrated effort. The construction and analysis of the simulation are presented in Chapters 4-11 of this volume, while results of archaeological analyses are addressed in Chapters 2 and 12-14. One motivation for this volume is that VEP research enables us to contribute a new perspective on one of the oldest and still most troublesome issues in the social and biological sciences: the question of adaptation. Different beliefs about the importance of adaptation have riven communities of anthropologists since at least the 1970s, and that's just the recent past. This conflict is connected to a much older contest between "historical" and "structural" approaches in the social sciences evident in western thought by the nineteenth century and present even long before (McAllister 2002). In the remainder of this chapter we briefly review where anthropology stands with respect to the concept of adaptationism; explain our focus on settlement systems as the main database in this volume; describe some local antecedents to this project; and locate the local prehistory in regional and worldwide contexts. Adaptation and Optimality DebatedIn the simulations discussed in detail in later chapters, the rules we impose on our agents lead them to live in places that are approximately optimal, in the sense and within the constraints defined more carefully below. Optimality principles have guided theory formation In physics from at least the seventeenth century; in 1662 Pierre de Fermat formulated the Principle of Least Time-that "a ray of light, moving through an arbitrary medium...will follow, out of all possible paths, that path for which the transit time of the ray is a minimum" (Rosen 1967:2-3). Two hundred years later Darwin articulated the principle of natural selection for living systems, which predicted that in conditions of competition, entities that in some sense compete more effectively than others will better survive that competition and leave more offspring. If furthermore the characteristics that led to that comparative advantage are heritable, then those characteristics will spread in the population. Of course, even within biology there has been lively debate between those who accord adaptation a more, or less, central role in evolution-compare for example Maynard Smith (1978) and Mayr (1983) with Gould and Lewontin (1979). In the social sciences, principles of optimality have enjoyed their greatest authority in economics, generating a huge literature on topics such as individual optimizing behavior, and, in macroeconomics, optima within the consumer and producer sectors. In anthropology and archaeology, on the other hand, we encounter profoundly conflicting positions on the usefulness of optimality either as a guide to research or as a principle whose past or current potency can be counted on. Within archaeology specifically, most processualists probably agreed with Kirch (1980:102) who characterized adaptation as "a robust concept capable of integrating disparate methodological orientations and of relating them to a central theme of culture as man's unique method of meeting environmental challenges." Human behavioral ecologists also subscribe to the concept of adaptation by asserting that humans have evolved to make approximately optimal choices under changing environments with respect to behaviors that plausibly affect fitness, including prey choice, patch choice, resource defense, mating strategies, and signaling strategies (e.g., Bliege-Bird and Smith 2005; Kelly 1995; Smith 1992). Other strands of evolutionary thinking in anthropology, such as evolutionary psychology and dual-transmission theory, handle optimization in ways that typically offer quite variable predictions while retaining a foundation in optimality thinking. Marshall Sahlins (1976), on the other hand, is one of many anthropologists who have argued that human cultures do not arise from practical, utilitarian considerations that lead to adaptive advantages. Sahlins argues that the "decisive" quality of culture "is not that [people] must live in a material world, circumstance [shared] with all organisms, but that [people] do so according to a meaningful scheme of [their] own devising, in which capacity mankind is unique" (1976:viii). The course of archaeological theory since the 1970s has shown that Sahlins could not have been more prescient in finding that "the contest between the practical and the meaningful is the fateful issue of modern social thought" (1976:ix). Some post-processualist approaches to archaeology, for example, make no room for either optimality or competition among their foundational principles. Michael Shanks and Christopher Tilley (1987:51), for example, consider "rationality" (in which there is an implied economy or efficiency of behavior) to have valid referents only in contemporary capitalist societies. They argue that most human action has no direct survival value and that our task as archaeologists is to understand the free choices that people made and the stylistic record that those created through time (1987:56). In the face of such positions we make three main arguments for emphasizing optimality in our models. The first is that people clearly live in a material world, which makes certain demands. People meet these demands in part by attaching meanings to their world, and to the utterances of others, which gives them leverage in the material and social worlds. But systems of meaning are difficult for archaeologists to decipher, and we ought to take advantage of every opportunity to study them. Settlement systems almost certainly contain information relevant to this task (Thomas 1999) but to be able to interpret them in that way we propose (contra Thomas) that one ought to assess the degree to which they might be explicable by practical considerations. Second, it is, or ought to be, an empirical question as to "how much" of a settlement system, or any other aspect of ancient practice, is attributable to practical considerations such as efficiency of resource access. This is an extraordinarily difficult thing to assess, though, and it is not surprising that most archaeologists have taken an a priori stance on the theoretical issue at stake rather than attempt an empirical assessment of the adaptation model for particular settlement systems. Such assessment however can bear several fruits. If we can assess the extent to which adaptation shapes any particular settlement system, then we may be able to identify times when these pressures are strongest, and propose reasons for those differences through time, as we do in chapter 10. This requires us to consider the empirical archaeological record with the same care that we devote to constructing models of it (see especially chapters 2 and 14). Finally we recognize that even if they are relevant, simple optimality models will fail to explain important aspects of settlement systems-as they have for other human and non-human behaviors to which they have been applied (Maynard Smith 1978:52-53; Smith 1992:54). As Robert Foley concluded in his review of optimality theory in anthropology, "the main strength of an optimality model lies in the fact that its methodology provides a template for comparing behaviours. The point to stress about optimality theory is not that behaviours should conform to the template, but that it provides a standard of measurement and comparison against which deviations can be assessed" (Foley 1985:222-223). The ways in which such models fail will be of interest because they will contain information on the many social, political, and symbolic considerations affecting settlement systems that were not incorporated into the optimality model. In short, a model does not have to be complete, or completely correct, for it to provide a useful foot into the explanatory door. We think that the common, though partial, success of human behavioral ecologists and other social scientists who make predictions based on assumptions of adaptation warrants an approach that is less interested in determining the existence of adaptive behavior than in trying to understand how central adaptation has been in various domains of human action. Here we find a framework proposed by philosopher of science Peter Godfrey-Smith to be useful. Godfrey-Smith (2001) recognizes three kinds of adaptationism in current biological thought, but his definitions are general enough to be applicable to anthropology as well. The first is empirical adaptationism, the strongest form, which holds that "natural selection is a powerful and ubiquitous force...to a large degree, it is possible to predict and explain the outcome of evolutionary processes by attending only to the role of natural selection" (2001:336). The second is explanatory adaptationism, which is a bit trickier. Godfrey-Smith defines it as follows: "The apparent design of organisms [we might also say societies or cultures] and the relations of adaptedness between organisms and their environments, are the big questions, the amazing facts in biology. Explaining those phenomena is the core intellectual mission of evolutionary theory. Natural selection is the key to solving these problems: it is the big answer. Because it answers the biggest questions, selection has a unique explanatory importance among evolutionary factors ... even if it is rare" (2001:336). The third possible position is methodological adaptationism. This one is easy: "The best way for scientists to approach biological systems is to look for features of adaptation and good design. Adaptation is a good 'organizing concept' for evolutionary research" (2001:337). Unlike the first two varieties of adaptationism, this is simply a policy recommendation, not an ontological claim. Based on evidence to be presented in chapter 10, we will argue in chapter 15 that both explanatory and methodological adaptationism make sense in the study of small-scale human societies in which households retain considerable autonomy of decision making. But we will also argue that much interesting variation in the archaeological record remains unexplained as household-level adaptive behavior, and that our next logical task is to develop methods to study how much social, political, and religious behavior can be explained as adaptive behavior of competing groups-and how much cannot. A Focus on Placement and LandscapeIn this book, our chief database is the location and sizes of habitation sites. These farmsteads, hamlets, and villages were formed of varying numbers of households who constructed particular facilities, and who placed their settlements on the landscape in particular ways that changed through time (chapters 2, 10, and 14). This requires us to develop a method-agent-based simulation-that can cope with the fact that the locations of resources, too, are constantly changing due to both variability in climate and human use. Two chapters, though-by Sarah Cole and Fumi Arakawa-develop other databases to help us understand the changes we see in settlement practices in our area. These chapters are particularly important precisely because the social behaviors that they allow us to infer do not, for the moment at least, emerge from or figure in our household-level agent-based models; we need to infer these behaviors directly from the archaeological record. We focus much of our analytical attention on settlement patterns because there is good evidence that these spatial arrangements of households-and how they change by choice or necessity-are packed with information about ecological and social relations, if only we knew how to decode it. Archaeologists (and geographers) have taken the locations and sizes of settlements as something to be explained since at least the 1950s. Gordon Willey is among those most responsible for focusing archaeologists on settlement patterns, which he described as the "way in which man disposed himself over the landscape in which he lived. [The term] refers to dwellings, to their arrangement, and to the nature and disposition of other buildings pertaining to community life. These settlements reflect the natural environment, the level of technology on which the builders operated, and various institutions of social interaction and control which the culture maintained" (Willey 1953:1). In this research stream an interest that emerged quite early was the way in which settlement locations are tied to subsistence activities, which therefore inform us, indirectly, about how people provisioned themselves (see historical reviews in Kohler 1988b; Parsons 1972). Over the years, however, archaeologists have explored other parts of Willey's charge, becoming aware that site sizes and types, the distribution of sizes, the longevity of households and sites, and their placement relative to landscape features and relative to each other, contain additional information about a wealth of things we seek to know, including economy beyond subsistence (e.g., Kohler, Van Pelt, and Yap 2000), political processes (e.g., Lipe 2002; Spielmann 1994; Upham and Reed 1989), social organization (e.g., Adler 1994; Varien 1999a), level and type of resource control (Adler 1996; Kohler 1992), cultural norms and preferences (Thomas 1999), and even underlying cognitive metaphors (Ortman and Bradley 2002). In fact, settlement systems are potentially affected by-and therefore may contain information about-virtually all the domains of culture and behavior that archaeologists aim to reconstruct. Moreover, this information is embedded in a trajectory of change that provides additional opportunities for inferring causes for the changes in the patterns that we see. None of these claims would have surprised Willey, though he would have been interested in the new and sometimes ingenious methods for establishing them. Unfortunately, the information richness, or multidimensionality, of settlement patterns poses a severe problem for archaeological interpretation. When settlement practices can in theory be affected by many factors, how do we know which factors in what mix are in fact effective in any given case? Traditionally, and quite rightly, archaeologists have turned to excavation to gain independent data about subsistence, economy, and social organization that can help us to select among alternative understandings. Excavation however is slow, expensive, destructive, increasingly difficult politically in many contexts, and severely limited in its spatial scale. It seems unarguable that we need to understand settlement at larger scales and to do that we have to learn to extract more information from survey data that in many areas are quite extensive. The problem of how to understand the processes responsible for a (settlement) pattern, and why that pattern changes, is a common one in the historical sciences. Like all scientists we must always work in two directions: inference of processes from patterns, and deduction of patterns from processes. For a hundred years or so archaeologists have been exploring how far we can go along the first path, and we may now be bumping up against its limits. Consequently we will tend to concentrate in this volume on the second strategy: we create an agent-based simulation, which is an engine for deducing patterns through time from the processes we program, and then compare the outcomes of those simulations to what we know about the archaeological record. In theory at least we can specify whatever processes we wish in the simulation, and then view and analyze the patterns that result from those processes, allowing us to make well-informed claims about the processes that generated particular patterns. These are claims of "generative sufficiency" in the jargon of some modelers (Epstein and Axtell 1996:19-20), which means that if the specification of the model allows us to generate in silico a phenomenon of interest, we have determined one way in which that phenomenon might have been produced in vivo. The VEP is devoted to understanding the processes that produced the changing settlement patterns through time of ancient Pueblo farmers. At the beginning of this chapter we described how we assembled the current team in response to NSF's call for proposals, and how the VEP brings together two main raw materials: spatially and temporally organized environmental and archaeological data, and agents (computer processes) that act on those data using rules supplied by the programmers. Since archaeologists have always been in the business of collecting data and organizing it temporally and spatially, this project can draw on a century of accumulated research in or near our study area in southwestern Colorado (Plate 1.1). Most likely the VEP would not have come to be without the DAP. Between 1978 and 1985 archaeologists from the University of Colorado and Washington State University (WSU) investigated the northeastern corner of the VEP area along the soon-to-be-dammed Dolores River. The Dolores Archaeological Project became famous for the numerous Basketmaker III (A.D. 600-750) and Pueblo I (750-900) habitations in the Dolores area, and provided both editors of this volume with their first experiences in the Southwest. This takes us back to a time when the first geographic information systems (GIS) were just becoming available, and their use was still extremely limited; spatial data analyses were still very difficult and time consuming. Richard Darsie's WSU master's thesis (1983), which came out of the DAP, shows this by example. For 538 points distributed across the Dolores area Richard collected, by hand from various maps, data on eight soil variables, generating four classes of agricultural suitability whose distribution varied during three periods distinguished by their climatic regimes. Using SYMAP, a computer-mapping tool common in the 1970s and 1980s, and a mainframe mapping program called VICAR, he generated three continuous surfaces (estimates) of agricultural suitability from these point data, one for each of these periods. He then compared the proportions of these classes in the catchments of fieldhouses versus habitations through time. He found strong patterning: for example, there was a steep decline in the availability of the best class of land in his last period, from A.D. 880-950, and a shift from arable land as a determinant of habitation-site location before 880, to a determinant only of field-house placement after that. Darsie's research helped us understand the functional differences between these site categories and characterize the problems faced by the local inhabitants as conditions for agriculture deteriorated in the late A.D. 800s. As Darsie was completing his thesis in Pullman, Barney Burns was completing a monumental dissertation at the University of Arizona, Tucson, on a related problem. Burns used a combination of historic weather-station data, historic production data, and tree-ring data to demonstrate that ratio-level estimates of potential maize productivity could be made on an annual basis for portions of southwestern Colorado (Burns 1983). For the period from A.D. 652 through the thirteenth-century depopulation, he demonstrated that many periods of surplus production were also periods of intense construction activity, particularly of public or civic structures like great kivas. He also demonstrated that the period from A.D. 1276-1299 "was the worst period of storage shortfalls to have plagued southwestern Colorado's Anasazi" (Burns 1983:295) and was exceeded only once, from A.D. 1528-1551, long after farmers had left southwestern Colorado. In Chapter 6 we continue to build on Burns' methods (see also Berry and Benson 2010). Shortly thereafter, Janet Orcutt (1987) published an examination of DAP-area agricultural ecology that considerably refined and expanded Darsie's efforts. She used a small FORTRAN program to collect catchment data for sites and random points from a series of mapped data organized by square cells 200-m on a side. She demonstrated that good agricultural land was a more important and consistent determinant of habitation site placement than was cold-air drainage risk or vegetative diversity. Fieldhouses, on the other hand, were frequently quite responsive to avoiding cold-air drainage risk in their placement. At the same time, Kohler, Orcutt, Blinman, and Petersen (1986) were examining whether population loss or gain at DAP sites, from period to period, could be explained according to the principles of least cost, where the only cost considered was the travel distance between habitation and fields. This entailed simulating, for each habitation site in each period, how far the occupants would have had to walk to their fields. In addition to requiring estimates of numbers of households by period for each site, we created a grid-based reconstruction of agricultural productivity for each period, and devised a spatial simulation for "claiming" fields in grid cells at increasing distances from the habitations until the caloric needs of the estimated number of occupants were satisfied. Then the costs for each site could be regressed against the number of households at each site in that period. This analysis allowed us to identify places where agricultural production was either relatively expensive or relatively cheap, based on this measure. If minimizing costs for agriculture were a primary motivator of movement, then we would expect relatively "cheap" places to gain population across period boundaries and relatively expensive places to lose population. To our surprise, in most transitions between periods the opposite was the case-people aggregated in places even though, in so doing, they increased their distances to fields. It seemed clear from our results that the process of aggregation in the DAP area was not in any simple sense an attempt to minimize costs, at least for agriculture. In fact, aggregation in general had the opposite effect. Subsequent research with these simulations (Orcutt et al. 1990) showed that the main local episode of village formation, in the ninth-century Pueblo I sites, had the effect of dramatically lowering conflicts over agricultural catchments, at the expense of slightly raising per-household agricultural costs. For Kohler this research proved to be a formative moment, and nicely illustrates two principles underlying the present work. In many ways, in fact, the VEP is an expansion of the research program in these two papers, taking into account a number of additional resources, operating on a much larger area, and through a longer span of years. First, the DAP simulations strongly suggested that competitive social pressures were sometimes more important than simple minimization of agricultural costs for causing households to bunch together to form large and well-bounded communities. Second, it showed that controlling for resource-acquisition cost effects via simulation allowed us to isolate these social effects much more convincingly than we could through any verbal or statistical argument alone. The same research though also illustrates the slipperiness of the concept of "adaptation." In treacherous times living in large sites or in defensible locations far from fields may provide a better fitness outcome than living near one's farming plots. Fitness responds to the net effects of all one's practices; adaptation (behavior if you prefer) typically can't optimize all considerations at once; more commonly some are optimized at the expense of others. Later on in this volume we therefore develop a measure of how well habitation site sizes and locations simultaneously minimize costs of acquiring several different resources. We cannot presently measure how well they serve to minimize most social costs, such as the possibility of being dislodged by another group. At best we can hope to identify these costs in the residuals from our expectations, in combination with various kinds of empirical evidence. The work of Carla Van West provided another key precursor to the research we report here. In her 1990 WSU dissertation (published 1994), Van West was able to spatialize the sorts of annual maize production estimates that Burns had produced for southwestern Colorado as a whole. This was a critical step towards constructing a dynamic landscape that agents could explore and settle. With this in place, Van West and Kohler (1995; Kohler and Van West 1996) could begin to employ a body of theory that made strong and non-intuitive predictions about how exchange between households should to respond to variable amounts of production. As explained by Smith (1988) and Smith and Boyd (1990), this theory has roots in microeconomics, evolutionary ecology, and game theory. Under certain (not very restrictive) assumptions about the shape of households' utility functions, we could predict that households seeking to maximize their marginal utility should exchange maize with other households in times when local production was generally high, but also spatially and temporally highly variable. On the other hand, when production was generally poor, but still highly variable across space and through time, households should hoard their maize, not exchange it. If we further assumed that early Pueblo villages were built on interhousehold exchange, we should find that villages form in periods of high (but variable) production, and fall apart when production is low but variable. These predictions were quite accurate (Kohler and Van West 1996). We discovered however that population size was a confounding factor that needed to be taken into account: aggregation (which we took to be a proxy for exchange) was more common than expected when populations were high, and less common than anticipated by the production model when populations were low. But even this work didn't fully exploit the possibilities of the dataset that Carla had constructed, since the analyses were aspatial: they just worked with maize production means and variances across the entire landscape. A more interesting examination of these predictions would be to simultaneously look at the situations of many households located in different portions of the landscape. Would such households-equipped of course with the appropriate sharing rules-spontaneously form and abandon villages in the times and places where we actually see these behaviors in the archaeological record? The VEP was formulated partly as an attempt to rigorously examine that model (see chapter 15). Our initial VEP simulation results were reported in a 1997 symposium held at the Santa Fe Institute and funded by Wenner Gren (grant 4799; Kohler and Gumerman, ed., 2000). In that work, we construed agents as nuclear families, as we still do, and loosed them on Van West's paleoproductivity landscapes, to which we had added the known water resources. The history of the simulation program itself, which we often just call "Village," is reviewed in Chapter 4. As a result of that first round of research we concluded that rules governing site locations in the Pueblo II (A.D. 900-1150) and III (1150-1280) periods in our study area were rather different, though in both eras the best-fitting rulesets required households to take into account the distribution of both water resources and the most productive lands for dry farming. We also thought we had evidence that the actual location of Pueblo III households was more inefficient than Pueblo II household location because Pueblo III sites were located further from the "ideal free distribution" simulated by our agents. Finally, we noted that simulations in which agents degraded lands slightly through farming provided a better fit between the simulated and the actual household-location patterns than did no-degradation scenarios. This brings us back up to 2001, when we found these results sufficiently encouraging to propose the VEP to NSF. The VEP extended the approach taken by Kohler et al. (2000) back to A.D. 600, expanded the suite of resources that our agents tracked, and enabled simple economic interactions among the households. Just as importantly, it funded a large empirical data collection effort reviewed in the next chapter and in chapter 14. Farmers first moved into the central Mesa Verde region (Plate 1.1) in significant numbers around A.D. 600. This itself is something of a puzzle, since maize farming had arrived in some other areas of the Southwest slightly before 2000 BC, aided by irrigation, floodplain aggradation, increased effective moisture, and a pre-existing pattern of repetitive land-use, focus on annual seed plants, and grinding-stone technology that facilitated its adoption (Roth and Freeman 2008). Maize was present in the northern Rio Grande by 1000 B.C. (Vierra and Ford 2007), and first appeared in the Four Corners area remarkably early-around 2000 BC-though a commitment to farming as the primary food production strategy did not occur until about 400 BC. At that time, early farmers occupied the areas to the west and east of the VEP area. Mona Charles and Sally Cole (2006) identify eight clusters of Basketmaker II (BM II-pre-pottery farming) sites in the Four Corners region, seven of which were present by 400 B.C. The settlement cluster closest to the VEP study area is near Durango, Colorado, and it is among the youngest, with clusters of tree-ring dates in the second, third, and the fourth centuries A.D. (Charles and Cole 2006:173). Wright points out in Chapter 3 (see also Wright 2006:Figure 21) that his new pollen-based low-frequency temperature reconstruction for southwestern Colorado suggests quite cold temperatures from 100 B.C. till almost A.D. 600. Though the general trend is towards warmer temperatures through time, there is also a century of warmer conditions centered around A.D. 325 that might have been critical to the success of maize farming in the more northern BM II locations, like Durango. Rapid population growth during the NDT presented a challenge to early village social organization. Growth in community size produced rapidly increasing levels of internal conflict ... at a rate approximately proportional to the square of the village population ... a critical rate of social stress was quickly reached .... [V]illage communities were [then] presented with two options: (1) they could fission into two or more daughter communities, each smaller than the critical threshold size, or (2) they could develop some social mechanism that regulated and managed internal conflict in such a way as to make fissioning unnecessary. These conflict management mechanisms were frequently of a religious or ritual character ... but we must imagine that the variety of possible solutions to the problem is as large as the variety of early village cultural diversity and historical experience. However, only the development of novel institutions of social integration at a suprahousehold level could make possible the emergence of villages larger than the critical population threshold, here provisionally defined as approximately 300 persons [Bandy 2008:341]. To summarize, Type I villages could appear and maintain themselves because their inhabitants had successfully innovated social mechanisms that allowed them to exist at population sizes larger than could have been maintained given only the social mechanisms available to earlier smaller settlements in the same region. And something about the rapid growth rates in the first phase of the NDT, when such villages appear, made crossing that threshold much more likely than it would have been in earlier or later phases of slower growth. Large villages never appear in some sequences of course, and occasionally they may appear simultaneously with the appearance of agriculture when immigrants bring both farming and a habit of living in large settlements.Any model that purports to be applicable worldwide is necessarily very general, and this model is not a bad skeleton on which we can begin to drape the richer set of historical circumstances involved in the first local round of village formation, the apparent reasons for the demise of those first villages, and the later appearance of more persistent villages followed ultimately by their demise as well. By the final chapter these efforts will allow us to present a more comprehensive historical narrative for village formation and demise in our area, for others to compare in other Neolithic settings. Ancestral Pueblo farmers encountered the deep, well watered, and productive soils of the central Mesa Verde region of Southwest Colorado around A.D. 600, and within two centuries built some of the largest villages known up to that time in the U.S. Southwest. But one hundred years later, those villages were empty, and most people had gone. This cycle repeated itself from the mid-A.D. 1000s until 1280, when Puebloan farmers permanently abandoned the entire northern Southwest. Taking an interdisciplinary approach, this book examines how climate change, population size, interpersonal conflict, resource depression, and changing social organization contribute to explaining these dramatic shifts. Comparing the simulations from agent-based models with the precisely dated archaeological record from this area, this text will interest archaeologists working in the Southwest and in Neolithic societies around the world as well as anyone applying modeling techniques to understanding how human societies shape, and are shaped by the environments we inhabit. Timothy A. Kohler is Regents Professor in the Department of Anthropology at Washington State University. Mark D. Varien is Research and Education Chair at the Crow Canyon Archaeological Center.